After 13 years of food writing, there will always be something new and exciting to discover. The latest to pique my interest is the custom designed Himalayan Salt Tile Dry Aging Cabinet at Hilton KL's spanking new Chambers Grill. Like a proud papa (he is one by the way) showing off his new baby, Chef Michael Elfwing was brimming with enthusiasm over the restaurant's sleek, custom-built showcase where prime cuts are hung and dry-aged from 14 to 36 days. According to Elfwing, the temperature and humidity-controlled cabinet extracts excess moisture from the meat to bring out its intense flavours while tenderising it throughout the aging process. These dry-aged cuts, when coupled with different grilling techniques that have just been introduced at Chambers, produce an alchemy of flavours and textures that are guaranteed to please the most discerning of palates. 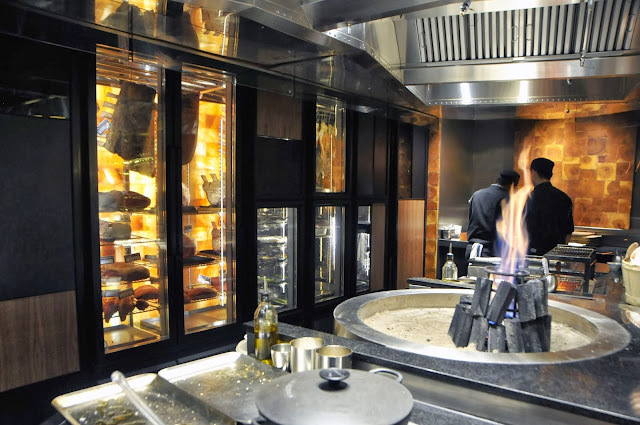 Amidst the kitchen's shiny outfittings, a circular sandpit where choice meat curs and skewers of meat and viands can be grilled “a la minute” around a charcoal pyre, on lava stones or following the traditional “robatayaki” style to exact desired doneness is almost a prehistoric throwback to the beginning of time. A simple “back to basics” concept that will undoubtedly attract serious carnivores who yearn to sink their molars into perfectly cooked cuts of their favourite meat. We started with some bewitchingly black charcoal bread - they were so irresistible that we had a difficult time trying to stanch our enthusiasm for them. But tummy space needed to be made for the feast that was to follow. As expected, Elfwing and his team outperformed themselves, plying us with skewers of moist, smoky and to-die-for Black Angus Tenderloin (RM45) that made for an incomparable first impression. The sides of grilled plump Portobello, Tomato, Grilled Feta & Spanish Onions, and skewers of Grilled Vegetables (onion, red, yellow and red capsicums) and Asparagus provided ample albeit brief distractions that enhance rather than detract. For dining parties of four or more, I'd suggest opting for the impressive Tomahawk (RM798) - a hefty aged for 21 days masterpiece starring a 1-kg bone-in Wagyu. Served with Natural Beef Jus, every forkful would unleashed a lusty flood of primal flinty, irony and flabby accents on the palate. Daubed a little of the house sauces: Mushroom & Hennessy XO or Herb & Spice Hollandaise for different flavour dimensions but the meat tastes best with a mere pinch of sea salt and if you like, freshly cracked black pepper. Those who eschew beef fret not. Sample scrumptious pink-centred Dorper Lamb Cutlets (RM58) or the gamier but no less delectable Lamb Rump with Guacamole (RM38). Tender to the bite, there's nothing namby-pamby about the latter's assertive flavour profile that one either love or loathe. Also on Chambers' meat-ting agenda: 350G Black Angus Prime Rib Dry Aged for 36 days, 250G Black Angus Ribeye Dry Aged for 28 days, 350G Black Angus T-Bone Steak, Dry Aged 36 for days and 250G Marble Six Score Wagyu Ribeye Dry Aged for 14 days. Seafood aficionados will find treasured gems like Gindara Fillet with a Light Curry Dusting (RM30) and Fresh Water Prawns (RM58). We were pleasantly surprised at how well the fish's inherent sweetness was amplified by the aromatic curry spices. At a whopping 300g each, the prawns gave us no cause for complaints; their springy freshness and natural sweetness lifted to heady gastronomic heights by a squeeze of warm lemon juice from the slightly charred, half a lemon that came served on the side. In between the meatier servings, we were tempted with Asian and European inspired side dishes (RM16-RM18 each) like Smoked Rice with Salted Hand Churned Butter, Roasted Three Onion Rice, Sand Baked King Edward Potato with Spiced Sour Cream and Grilled Eggplant with Garlic and Oregano among others. The beauty of Chambers lies not only in its gentlemen's club-like interior (think distressed leather seats and wood-topped tables, slender fluted pendant lights, reflective copper tinted satin metal ceiling and polished timber flooring) but also its menu flexibility that allows for endless possibilities - you decide how much you want to eat, how the offerings should be prep, what tipples you want to pair your food with, etc. 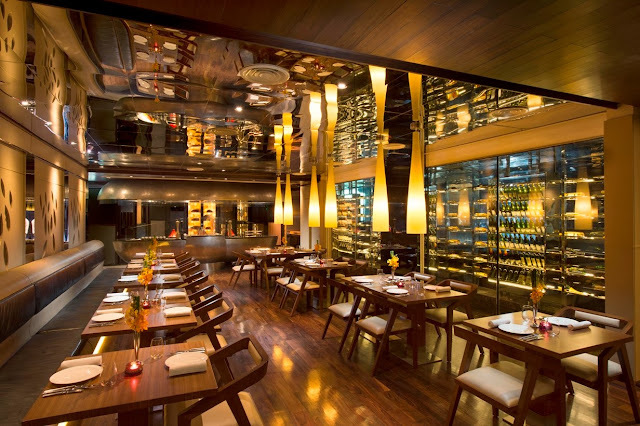 An impressive glass wine wall display separates the Grill from the hotel’s new main Bar; resurrected to double up as an entertainment area with a sweeping canopy slightly cantilevered off at the back for the creation of a private and intimate space. A great selection of champagne and wines, premium spirits, cigars, liquors alongside classic cocktails befitting a hotel of this stature is to be expected. 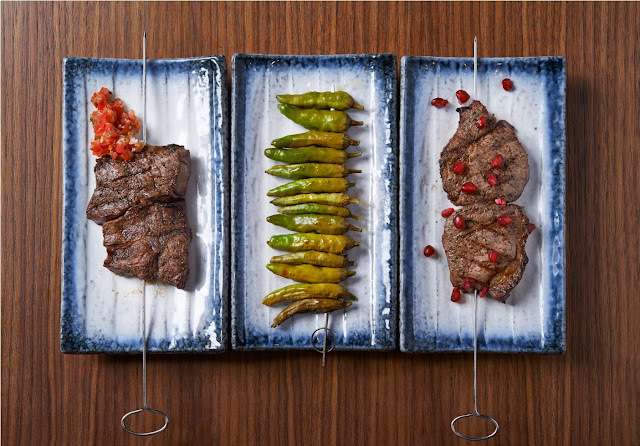 Food from the Grill is served at the Bar “tapas” style. Any dessert with liquor sits well with us so we unashamedly made short work of the Rum Baba (RM25) the minute it hit our table. Soaked in rum, the airy-light sponge cake served with vanilla ice cream and fruity chunks of mango, strawberries, passionfruit, melon and pineapple disappeared faster than Harry Potter. Another timeless classic given a fresh update is Berry Trifle (RM25), a stripey creation of vanilla custard, crushed raspberries, sponge cake and strawberry jelly in a glass, adorned with shards of meringue on top. I recall this luscious dessert ruled many a house parties years ago thanks to its merry colours and lush textures. The most decadent of the lot has to be the Chocolate Creme Brulee with Salted Caramel (RM18). Cracking the thin, torched sugar crust top, we unearthed dulcet-smooth and tofu-soft curd inflected with briny caramel underneath. Rich, creamy but luckily it stopped short of being cloying. Make no bones about it, Chambers deserved to be the main meat-ting point for serious carnivores from now on. For reservations at CHAMBERS, please call +60 (3) 2264 2592/ 2596 or log on to www.life.hiltonkl.com for more information.